Wednesday 1 November is the solemnity of All Saints and is a Holyday of Obligation. The November blessing of graves in Carbally takes place on Sunday 19 November at 3pm beginning with a prayer service in the church. This will be followed by the blessing of graves in both cemeteries. Our Novena for the Holy Souls begins on Sunday 12 November at the 10.30am Mass. Weekday Masses at 10am, until Monday 20 November. Envelopes will be available in the porches. Please hand them in to the sacristy, parish office or in the boxes by the sanctuary. 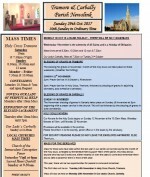 The first Mass will be on Tuesday 14th November in Holy Cross Church, Tramore. 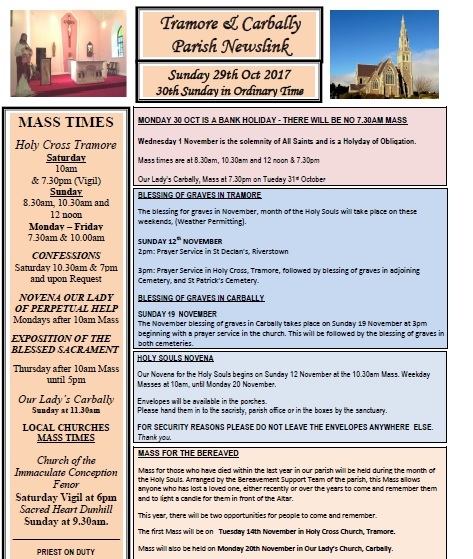 Mass will also be held on Monday 20th November in Our Lady’s Church, Carbally.